Creating a process to arrive at sensible, relevant, and positive agreements for tablet use in schools is a key part of the journey toward implementing a successful tablet program. The tricky part about this process is that it takes time and can be bumpy. As schools engage in the work of "building the bridge while crossing it," it is important for school leaders to stay the course, and not be deterred by the inevitable, and even welcome, hurdles that schools will encounter through the stages of implementation. A good rule of thumb: It takes three years to "land." 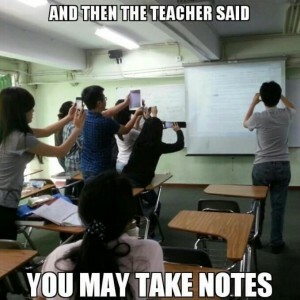 There is a wonderful, poignant photo that has circulated on social media where a classroom of students is seen standing eagerly with their iPads pointed at the white board with the caption, "And then the teacher said you may take notes." One of the key messages of this photo is that students may interpret or take steps in directions that we as educators might not see or anticipate as students have opportunities to learn with tablets. The takeaway for schools is that it is most helpful to be nimble and flexible in thinking about policy and practice. A key step in this journey toward successful implementation is to create a space for teachers to process together how the learning is going and to identify challenges. And, it is equally important for school leaders to acknowledge and say out loud that the road is bumpy and it is supposed to be bumpy, and uncomfortable at times. Another important step is to reach out to students to gather their input into what is working and what is challenging with tablet learning. The beautiful thing about kids is that they will be brutally honest and offer up suggestions and strategies to help with the learning process. As a result of our work at Marin Country Day School, and utilizing the above process, we arrived at 10 guidelines for successful use of tablets, based on feedback from teachers and students. The language in these guidelines is intentionally positive, focusing on actionable behaviors that will lead to success, instead of using language that focuses on "don't." 1. Charge your iPad before coming to school each day. This is a key part of instilling responsible behavior and placing responsibility on the student. It is a part of daily preparation and is achievable. 2. Keep your iPad in the case at all times. Again, this is about responsibility. We have found that breakage and cracks arise when students take the iPad out of the case. 3. Store the iPad safely inside your backpack. This is not easy to accomplish, but taking the time to help students find a proper spot inside the backpack goes a long way toward minimizing crack and breakage. 4. Manage your academic iTunes account. The use of the word academic is key. One important part of communication about rollout to students is that the tablet is a learning tool to help students with academics. Giving the students the responsibility and opportunity to upload the apps needed for individual classes places important responsibility on the shoulders of the students. Using a school issued Apple ID, students are asked to upload apps for certain classes as part of homework to be ready the next day for class. 6. Keep your iPad and your passwords to yourself. This is so critical as part of the learning process. Knowing where the device is at all times during the day is not easy to accomplish and students need to take on this responsibility, in addition to securing privacy by keeping passwords strong and not easily identifiable. 7. Use eBackpack. This is the online storage locker that we have provided for our students. Students take pride in being paperless and the more that students use online storage spaces for papers, presentations, and projects, the more the school can instill this habit in students and teachers. 8. Use Veracross. This is the student information system that we use where teachers post homework assignments and also where each grade level posts a test calendar, to balance the workload for students. A daily practice for students is to check Veracross for homework and assessment postings. 9. Stay on task. Three simple words. Not easy for students or adults. Stating the expectation and holding the bar high for students is important, while also acknowledging how challenging this is for all of us to accomplish. Having open conversations with students about how to "stay on task" in different classes is a key part of creating a healthy culture inside of each classroom. 10. Play outside – tech free recess! This is the last but perhaps the most important in terms of maintaining a healthy, balanced school day, especially in schools employing tablets. When we rolled this out to teachers they were thrilled; when we rolled this out to students, there was no pushback. Kids know they need a break and schools need to pay attention to this. As schools continue the tablet journey, the process of learning and conversation needs to be kept alive. A colleague of mine loves to use the phrase, "Be patient with the process." Success will not happen overnight. It will take time and a general time frame is three years to create the daily culture of positive, affirmative use of tablets.